Ebstein's anomaly is a rare heart defect that's present at birth (congenital). In Ebstein's anomaly, thetricuspid valve — the valve between the two right heart chambers — doesn't work properly. Kimberly Holst, M.D., is a general and thoracic surgery resident at Mayo Clinic and a resident in the Clinician Investigator Training Program. She received a research grant recipient from Regenerative Medicine Minnesota for a Phase I study in order to establish the safety and feasibility of intramyocardial injection of autologous bone marrow-derived stem cells into the myopathic right ventricle of patients with Ebstein anomaly at time of elective cardiac surgery. 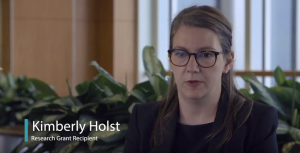 Click here and watch the video below to learn more about Dr. Holst's research.